Railpictures.ca - John Pittman Photo: CN train 421 is powered by an SD75i, ES44ac, and Dash 9-44CW, on the first day back to Standard Time. Fall colours are well advanced, with many leaves fallen. There is frost on the shaded part of the ties. The engines are approaching the signal for CN Bayview (Junction) as the train continues its departure from Aldershot Yard at CN Snake, with over half the train still rolling out of the yard. CN 421 goes to Port Robinson Yard; on this day it is following VIA train 97 the “Maple Leaf”, Amtrak equipment en route to New York City via Niagara Falls. | Railpictures.ca – Canadian Railway Photography – photographie ferroviaire Canadienne. 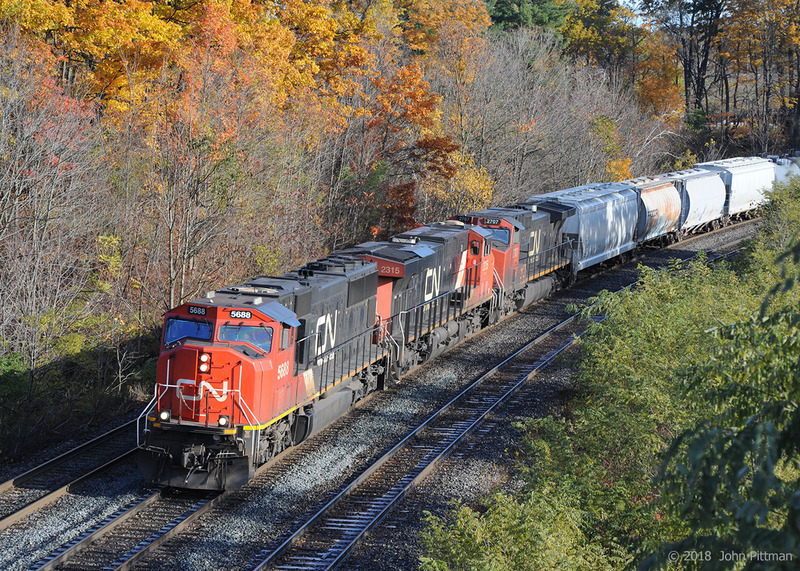 Caption: CN train 421 is powered by an SD75i, ES44ac, and Dash 9-44CW, on the first day back to Standard Time. Fall colours are well advanced, with many leaves fallen. There is frost on the shaded part of the ties. The engines are approaching the signal for CN Bayview (Junction) as the train continues its departure from Aldershot Yard at CN Snake, with over half the train still rolling out of the yard. CN 421 goes to Port Robinson Yard; on this day it is following VIA train 97 the "Maple Leaf", Amtrak equipment en route to New York City via Niagara Falls.